ELLENSBURG, Washington — Last night’s officer-involved shooting claimed the life of Kittitas County Sheriff Deputy Ryan Thompson. Kittitas Police Officer Benito Chavez was wounded in the shooting and is currently at Harborview Medical Center. The vehicle came to a stop at the end of Pierce Street in Kittitas. The suspect exited the vehicle and exchanged gunfire with a Kittitas County Sheriff’s Deputy and a Kittitas Police Officer. The deputy received a fatal gunshot wound and was pronounced dead at Kittitas Valley Hospital (KVH). Additional responding officers arrived on scene. The suspect was also shot and is being treated at KVH. The Ellensburg Police confirmed the suspect later died. Late Tuesday afternoon, the Ellensburg Police Department released the identity of the suspect as 29 year old Ellensburg resident, Juan Manuel Flores Del Toro. 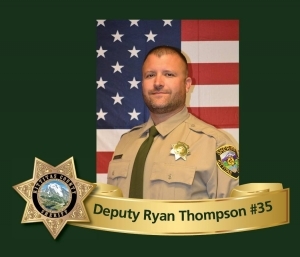 Donation accounts have been created at US Bank to help the families of the two Kittitas officers involved in yesterday’s shooting that claimed the life of Kittitas County Deputy Ryan Thompson and wounded Kittitas Police Officer Benito Chavez.